1977 was, of course, the year of punk rock. Marc was well aware of this and, in an interview in The Sun (February 1977) said that he had been waiting ‘for something like punk rock to come along…..I consider myself to be an elder statesman of punk” and declared himself “The Godfather of Punk.” Unlike many stars, he wasn’t afraid to put his money where his mouth was and “picked The Damned to tour with me because I wanted to put the best of the established bands against the best of the new wave bands, so we‘ll see who can out-punk the other every night” (The Journal, March 1977). A new T Rex album “Dandy in the Underworld” was released to fan and critical acclaim, and the band went out on tour with, as alluded to above, punk rock band the Damned as support. The tour was our chance to see a new, rejuvenated, slimmer Bolan, sharp-suited with smooth elfin looks, and a new band featuring Dino Dines (keyboards), Tony Newman (drums), Herbie Flowers (bass) and Miller Anderson (guitar). Although not every show was quite sold out, attendances were good, and the UK tour gained positive reviews. Bolan and T Rex were back on form and the future looked bright. 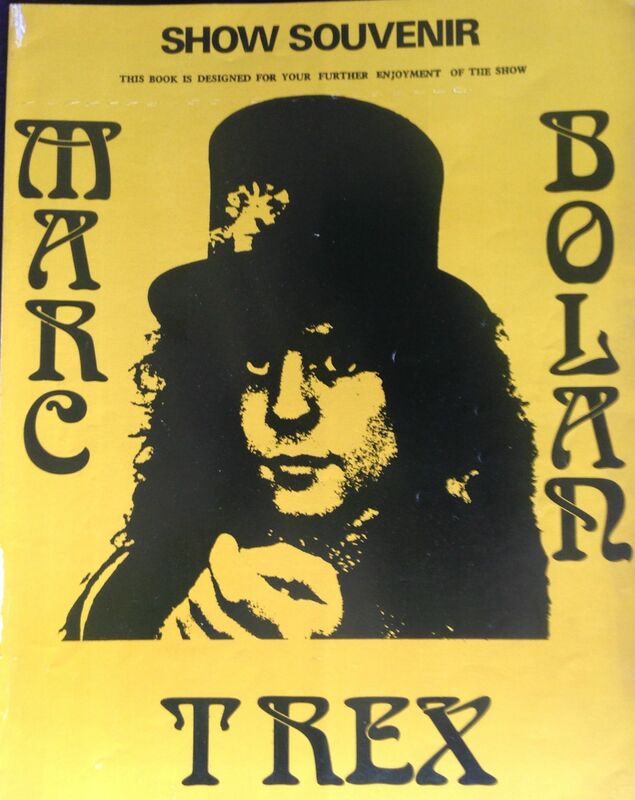 From the tour programme: “Bolan today is a genuine star – the man who put magic back into pop music; seldom heavy and most often playful….Marc is a global super-star who has toured over 500,000 miles in the last two years….I am a teenage idol I suppose”. Big statements, but actually Bolan could live up to them. 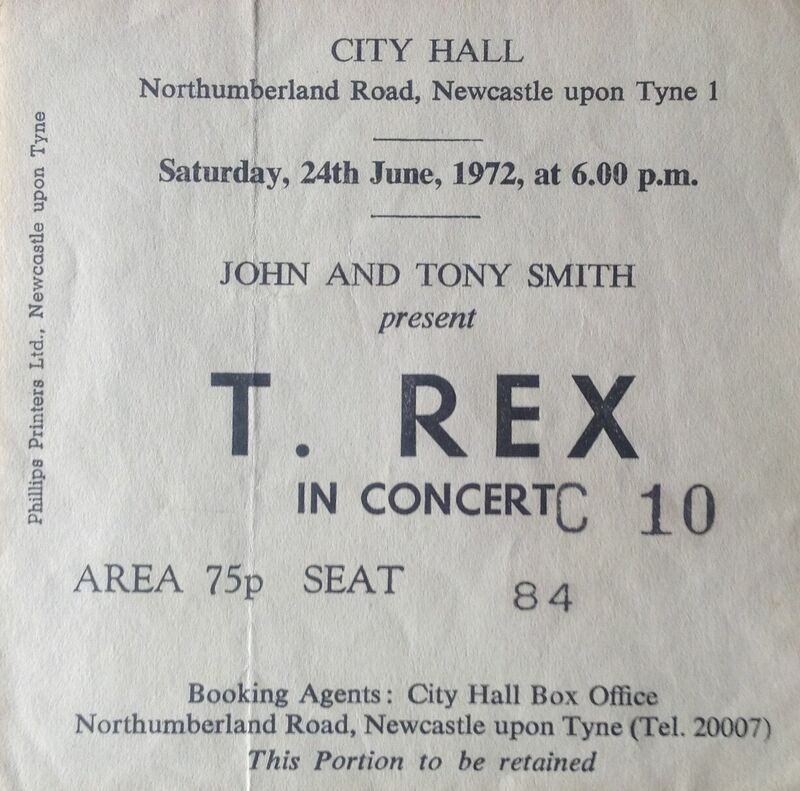 I saw the tour at Newcastle City Hall on 10th Macrh 1977. The Damned were their usual crazy manic selves; it was quite brave of Marc to invite them on tour with him, as it could so easily have back-fired. In fact, the pairing worked well, with the Damned warming the audience up, and T Rex playing a set containing a good mix of old and new and which showed just how good a live act Bolan and his band could still be. 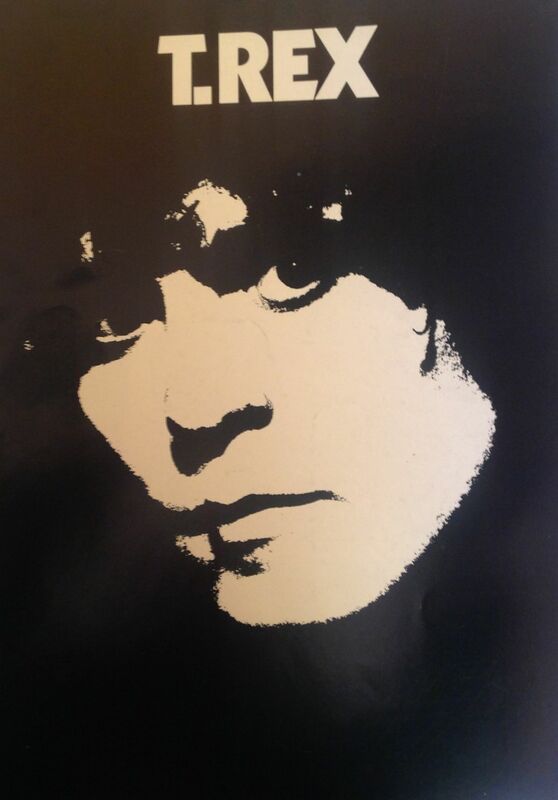 Bolan was enjoying a new surge in popularity, and he even talked about the possibility of performing again with Finn and Took, as well as reuniting with producer Tony Visconti. While driving home early on the morning of 16th September 1977, Marc Bolan’s purple Mini crashed into a tree, after failing to negotiate a small bridge near Gypsy Lane, Barnes, in southwest London, a few miles from his home. Bolan was killed in the crash, which took place two weeks before his 30th birthday. Thanks to Michael and his excellent http://www.dandyintheunderworld.co.uk/ site of the tour for helping refresh by memories and providing pointers to some of the reference material of the time. 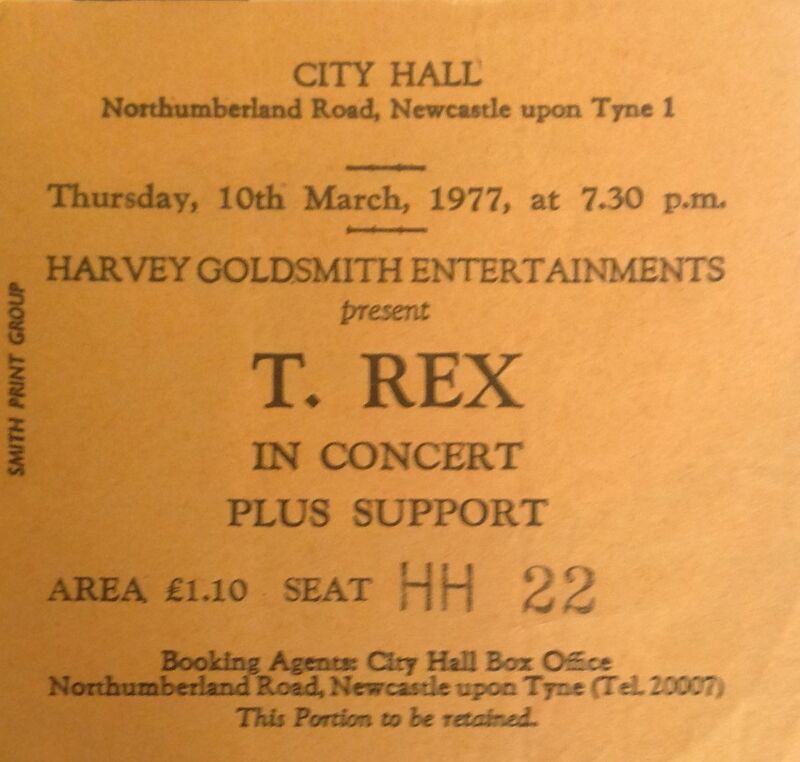 The tour called at Sunderland Empire on 15th Feb 1976, and support came from Lennie MacDonald. 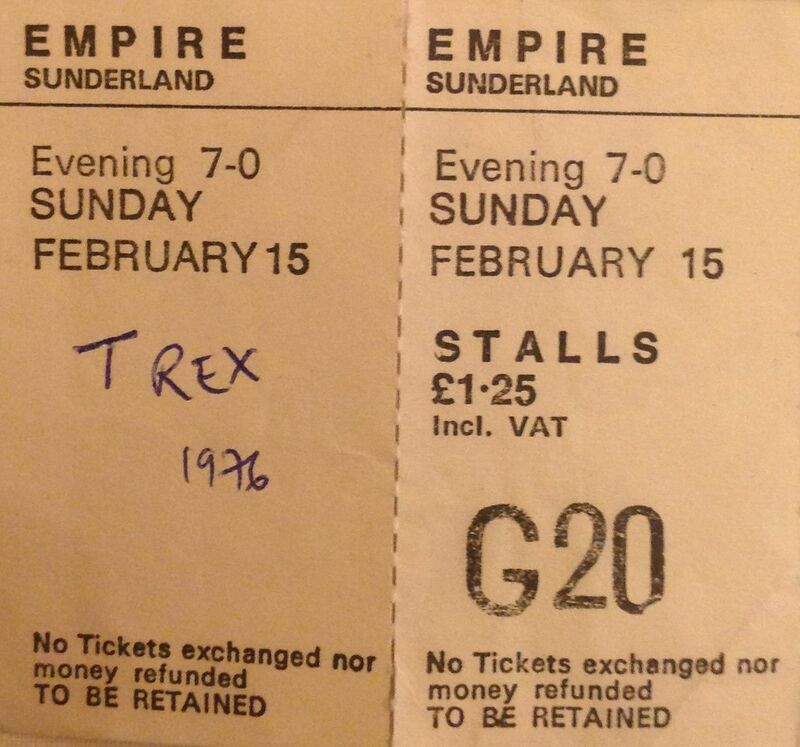 For the people of Sunderland that evening, it was T Rex mania all over again. The venue was packed and the crowd went crazy for Marc; we were back in 1972 again. A huge (futuristic) dragon stood at the back of the stage breathing flames towards us. The crush at the front resulted in some seats being smashed; and at one point during the acoustic set a guy jumped on stage to hug Marc. Unfortunately he grabbed Marc around his neck causing him to choke and he had to leave the stage for a little while. Luckily Marc was ok and T Rex returned to continue their set. The concert featured a selection of the hits and a few nods back to the early days. Life’s a Gas has always been one of my favourites. I can’t believe the ticket price was only £1.25 ! 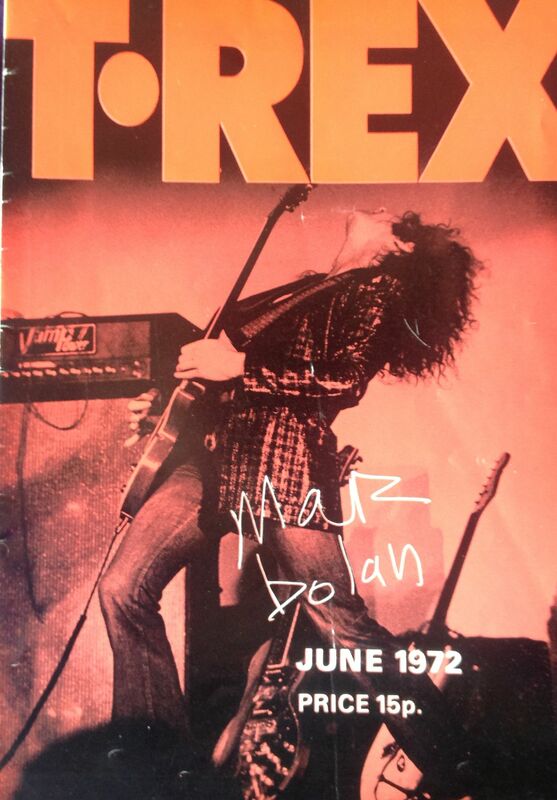 1974 was a year of big change for Marc Bolan and T Rex. Marc announced that “glam was dead” and that “T-Rex no longer exists.” He released the album ‘Zinc Alloy and The Hidden Riders of Tomorrow – A Creamed Cage in August’ and declared that his new band was called ‘Zinc Alloy and The Hidden Riders of Tomorrow’, an idea clearly borrowed from Bowie and his Ziggy persona. The record company was having none of it, and insisted that the T Rex monicker was retained. 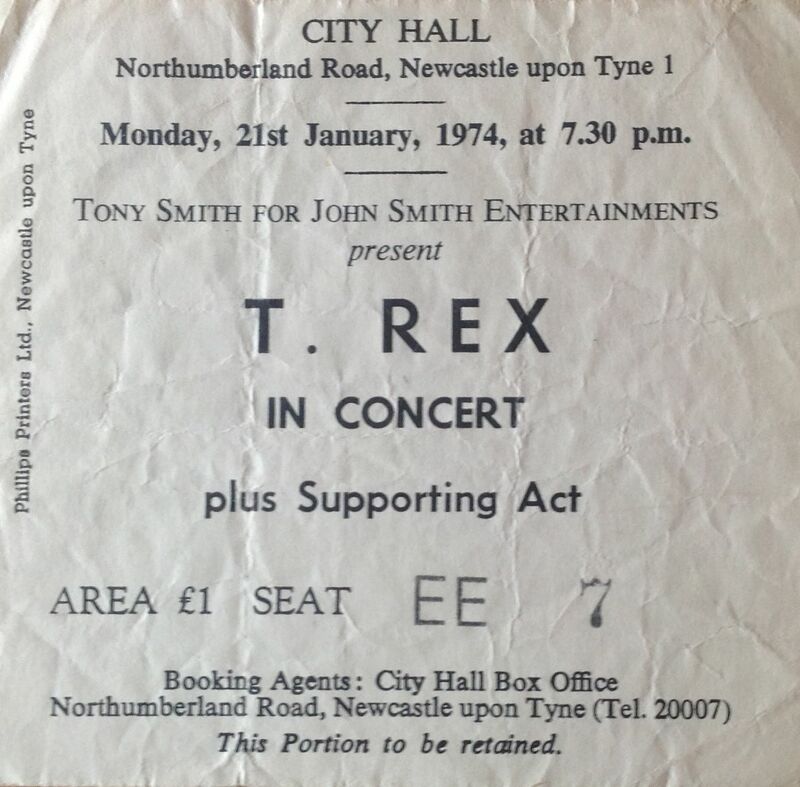 In January T Rex began their first British tour in over a year. The short six date tour started at Newcastle City Hall, and featured a new nine piece line-up. The new band still included previous members Steve Currie on bass and Mickey Finn on bongos, and added wife-to-be Gloria Jones and Pat Hall on backing vocals, two sax players and two new drummers Davey Lutton and Paul Fenton, replacing Bill Legend. A new single ‘Whatever Happened to the Teenage Dream’ was released, but it’s chart success was moderate. The tour sold well, although demand was nowhere near the heights of the 1972 outings. Marc emerged onstage lying on a massive hydraulic star which raised him from the floor so that he was facing the audience. Behind him was “T Rex” in massive lit stars. Marc had gained weight, and had his hair cut short (apparently his ex-wife June Child had cut his hair just before they split). 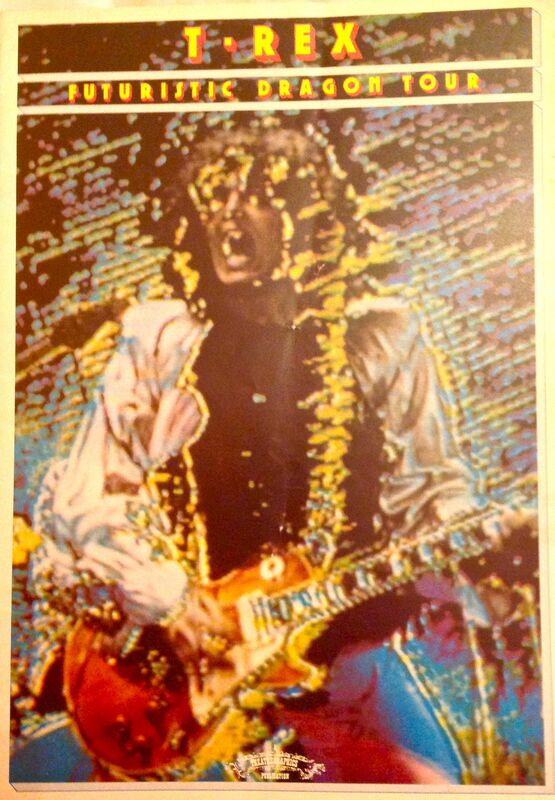 The new larger band gave the songs a fuller sound, and was beginning to resemble a soul review, but in doing so it lost some of the raw rock’n’roll edge of the previous T Rex. Although some screamers were in attendance, the crowd reaction was much more subdued, and there was none of the mad craziness of their 1972 shows at the City Hall. The T Rex star was definitely starting to fade. I don’t recall who the support act was; I have a feeling that there may not have been one (although the ticket says otherwise). 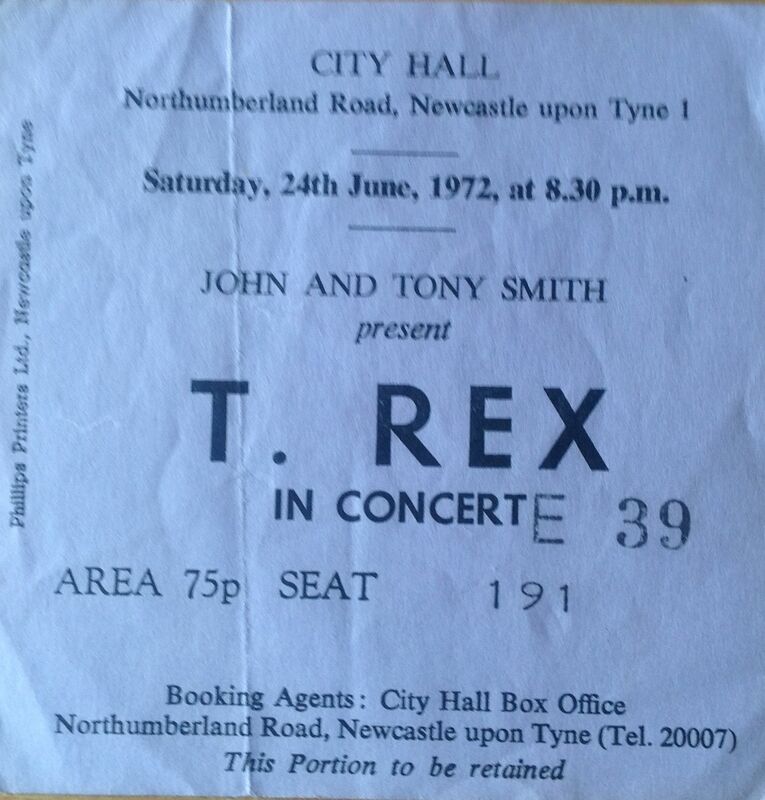 An enjoyable gig, but it didn’t reach the heights of the previous time I saw T Rex.